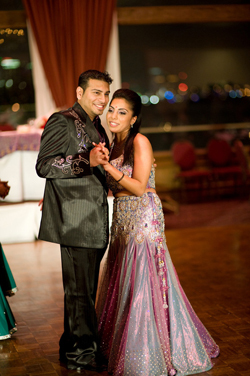 It was on a dance floor during a New Year’s Eve party in Las Vegas when Dino and Ekta met for the first time. The party, hosted by Young Sindhi Adults (YSA), offered the two fun-loving people the perfect chance to befriend each other. The following week of long feasts and dance parties only strengthened the bond. Dino’s confession, “One day I got to know from my Facebook wall that she visited Daytona a few weeks earlier without meeting me. I was annoyed. To compensate, she offered to buy me a drink the next time we met. Little did she know that I was going to make her my wife and make her pay for it – forever.” Half a year later they met in Chicago at the YSA retreat. It was during the Chicago weekend that Dino expressed his feelings for Ekta. The 16 hours that followed seemed like a lifetime of silence for Dino. Ekta was on her way to Hong Kong and for 16 hours, he could not hear her voice. It was way too much after that weekend. The flight ended in an immediate reconnection between the two, and the month-long trip added much love to Ekta’s life and reflected manifold on her roaming phone bill. What followed is love (hi)story. Next, the two families met, but as it’s a real life chronicle and not a Bollywood flick, the meeting didn’t result in any twists. Instead, they proceeded to sketching plans and taking the love story to the next level – the wedding! Something was missing – the love was there and the wedding plans were on – but where was the official on-one-knee western style proposal? Just in time, a week before the kachi misri, the commitment making ceremony, Dino found or rather carved out an opportunity. 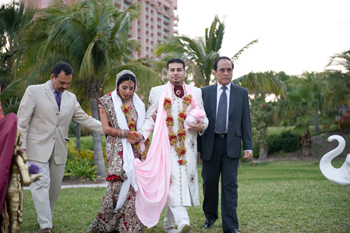 He invited Ekta to the christening of a friend’s baby in Daytona. After lunch, he took her for a walk on the beach. At this point, Dino said “Oh! I gotta tie my shoelace,” and before Ekta realized what was happening and that his shoes didn’t have laces, he was on one knee with the ring asking for her hand in marriage. Ekta happily accepted the proposal. Congratulations poured in from unknown witnesses passing by the spot. Sonal J. Shah, the wedding planner was hired to take care of the practical where-what-who items. A wedding cruise was unanimously sailing through both sides’ minds. Since both families were from Miami and Daytona, the wedding was undoubtedly to be in Florida. Miami was eliminated as a destination to keep guests from skipping events and clubbing in South Beach. Taking a cue from Cruise Plus’ advertisement in Desh-Videsh, bookings were made for the Carnival Imagination. The engagement and welcome party was to be held at the Rusty Pelican in Key Biscayne in March, and on the next day, all guests were invited to board the cruise. The mehndi and sangeet were scheduled to take place on the sailing ship, which was expected to inspire guests’ dance moves. One day later, the ship remained anchored in Nassau, for the lovebirds to tie the knot at the Atlantis and return to the ship for more festivities. Ekta and Dino decided to go with a deep purple and gold color theme after being inspired by a picture they found online of a butterfly. These colors were reflected in their invitations, gift bags, website, welcome bags placed in the cabins, their sangeet night outfits and décor, wedding favors such as T-shirts and luggage tags, wedding brochures (containing itinerary and details of the wedding), table cards, mandap décor, and more. The five different events offered an equal number of opportunities for the bride-to-be to showcase different shades of her beauty. To look ravishing on all those days, Ekta flew to India. With her mom, she visited Mumbai and Delhi searching for exclusive trousseaus. Ekta got her lehnga custom-made from scratch, and a panel made of Swarovski stones inspired her design. She herself designed the top of her outfit. Together, the duo coordinated the colors of their outfits. In planning a special theme for the sangeet night, they decided to get all the men in the family to wear alike. The result was that all the men from both the sides were wearing ivory sherwanis with purple embroidery. The only difference between the groom and bride’s side was in the patterns. Intelligent enough, Ekta flipped her colors and wore a purple base to her outfit, adorning silver and gold embroidery. Her exquisite attire for the mehndi ceremony was an exotic lime base with large pink, yellow and blue feathered rhinestones. The bride’s dress for the wedding reception was an interesting fusion of ethnic Indian design and Western fashion – she gave a desi touch with brocade and crystal stones to a Monte Carlo inspired-costume. The hair and make-up were the only things left unplanned by Ekta. But then there was an expert to take care of this area. Edin Carpenter from Los Angeles, a childhood friend of Dino and a celebrity hair stylist and make-up artists came to her rescue. On Thursday evening before the wedding, guests gathered in Miami to begin festivities. The welcome reception was a big fun event. The highlight of the evening was a photo booth where guests could put on props and take silly pictures to take home. The guests by then got an idea of the great fun that awaited them. The next afternoon, everyone boarded the all-welcoming Carnival Imagination. The mehndi bags made of pink and gold brocade with a drawstring were handed over to all the girls in the group. Placed in bags was a Ganesha keychain with crystals, two bracelets – one gold and one silver, and a bag of chocolates – purple and gold M&Ms with Dino and Ekta’s names, date and pictures printed on. Fresh flowers from outside were not allowed on board, so Jilna, the decorator from Suhaag Garden, used her creativity. She used wooden roses and boutonnieres created from buds to assemble the centerpieces and other decorations. The little time available to decorate the lounge was yet another challenge to face. Nevertheless, the décor was mesmerizingly beautiful. Purple and orange satin drapes were preset on the poles along with LED lights adding glitter to the flow. A similar color combination was used to cover bolsters and cushions were thrown over the lounge style couches. The wooden benches, mango parasols, amber lanterns and Moroccan tray tables placed around the dance floor simply added to the grandeur of the show. The stage bore a Moroccan touch with artifacts like hookahs, lanterns, panels and dividers. All guests tapped their feet on the dance floor to the beats of DJ Bosco, popular among Bollywood stars. The drink cards were already provided to the guests while boarding, so right from boarding to de-boarding all drinks were on the hosts. Then came the much-awaited evening, the most special day in the life of Ekta and Dino. The guests arrived in Limos from the cruise ship to The Atlantis and found a stage all so perfectly set with beautiful aisle pedestals and Laxmis with black magic rose, purple lisianthus and gerbera arrangements simply complementing the exotic mundap. Hanging all around the aisle were the natural curtains of red amaranthus and burgundy callas. Jilna exported the center of attraction, the four-pillared mandap with a Bengali backdrop overlay, all the way to the Bahamas. 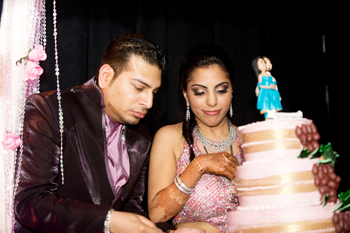 Widening smiles of the already joyous couple was the wedding cake with a topper designed as a caricature of Dino and Ekta. DJ Bosco played carefully selected numbers and the setting sun and rising moon offered just the perfect twilight hour for the two stars to walk down the aisle to exchange vows and unite forever. In a few moments, the moon appeared just above the mandap with the Atlantis in the backdrop offering a picture perfect moment for the evening. The next morning, a daylong reception party started on the deck. The seated breakfast, lunch and dinner were all served only as per the Indian menu with dishes selected personally by Ekta.